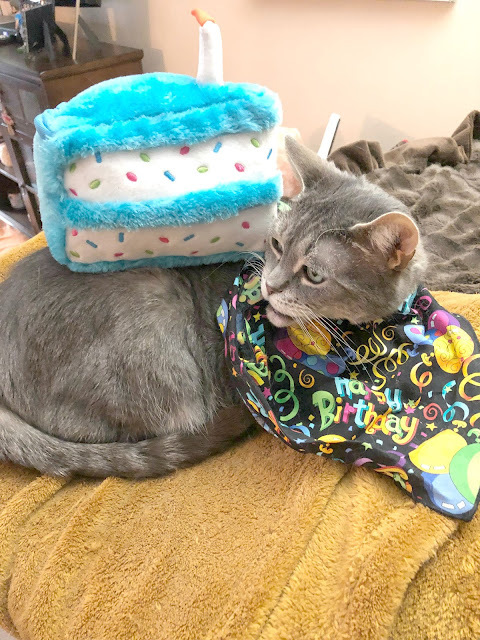 We found out recently that our friend Charlie of the blog Ten Lives And Second Chances is having all of his teeth removed due to a nasty virus. We saw this wonderful photo on the blog Ginger Jasper and hope that they do not mind our sharing. It is important to us to share this because Charlie's Mom is one of the most self-less people we have met throughout our blogging adventure. Not only do Charlie and his Mom read EVERY blog post of ours, they visit a vast number of blogs around the blog-o-sphere, always leaving a cheerful, fun and loving comment when they visit. Charlie and his Mom's visits are GENUINE, they make each and every one of us feel that we are the most important and valued people on the planet, and they make each of us feel that our blog(s) and our fur babies are some of the most adorable that they have ever seen. Even on many of our less-than-stellar posts, Charlie and his Mom always visit, always comment with love and their own patented special-kind-of-enthusiasm that only they possess! We want Charlie and his Mom to know that none of this has gone unnoticed. We love you Charlie and your Mom, and we are purring and praying with all that we have that by removing your teeth that the nasty virus will leave you alone!! We adore you both and deeply appreciate you! What a lovely blog and a brilliant post I am so pleased I stumbled across it! What a beautiful blog post. We will certainly go by and visit them after leaving here. I agree! Charlie and his mom are very dedicated to reading blogs from all over and I don't know how they have the time to do it but they find the time and it is so appreciated! Thanks for being such a great friend to them by posting this update! Very nice blogpost about Charlie and his mom ! How true! Charlie and his mom are the best! Lovely post. And a lovely photo of Charlie thanks for sharing. So sweet words. I´m purring to Charlie! @speedy thank you! We are too! @Repositorio thank you!! You know that we are too! @Sheba you are welcome, I wish I could take credit for the photo but I can't. 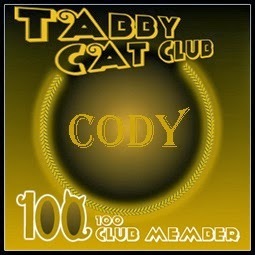 It was from Ginger Jasper's blog and I hope they don't mind that I used it. I linked to them! @The Teachers Pets...I can't take credit. I learned about it from others who also posted about Charlie. He and his Mom are dearly loved! @harrington thank you for your kind words! 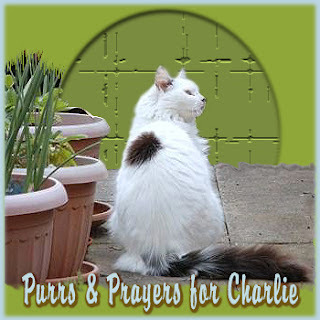 We have all been sending tons of purrs to that sweet Charlie. Awwwwwwww!!! Me and Charlie are so so so touched by your kind words lovely Cody and mum! Awwwww thank you so so so much! 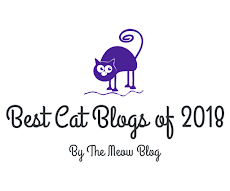 We are so humbled and so so grateful for such wonderful bloggers in the CB!! Yay!!! We totally agree! Charlie and his Mom are truly the best. 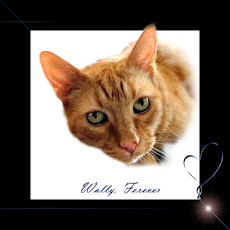 We are sending lots and lots of purrs and prayers to Charlie and his Mom. 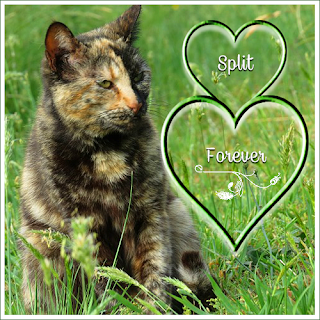 What a special blog today....Cody, you are an AMAZING artist (or as my Mommy says "ARTEEEEEST") and Miss Caren, you made my heart break for those two kitties, Alex and Charlie. 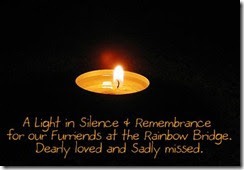 I'm saying kitty prayers for them and their families. A special "Sammy Hug" to you from me (and my Mom). All of the teeth? Ouch! Viruses are terrible creatures. All the cats in this house, and the ferals in the backyard are sending their purrs as fast as they can. I always think of purrs as prayers, anyway!